Which are the most ferocious dinosaurs? Only eight of the ten beasts in the film are dinosaurs - can you spot the two which aren't? What dinosaur predator was bigger than T-rex? How do scientists assemble a Stegosaurus skeleton? How did huge reptiles, called pterosaurs, fly? Pterosaurs are flying reptiles that lived in dinosaur times. What did a dinosaur tooth look like? How do scientists dig up dinosaur bones? What is the biggest dinosaur bone ever found? How many dinosaur facts do you know? Click on the play button to hear how to say the longest dinosaur name. 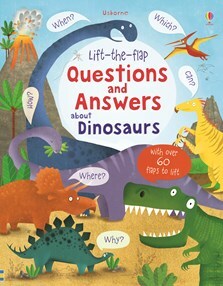 A colourful guide with over 60 flaps to lift to discover answers to questions young children might ask about dinosaurs. Provides simple and friendly answers to questions such as “Why do dinosaurs have tricky names?”, “Could dinosaurs swim?”, “How big was the biggest dinosaur?” and lots more. Includes a guide to some of the more difficult to pronounce dinosaur names. With Usborne Quicklinks to specially selected websites where children can find out more about dinosaurs. If your dino-mad children are plaguing you with some mammoth questions about the wonderful world of Tyrannosaurus rex and his prehistoric pals, why not let this brilliant interactive flap book provide the answers? There could be no better way to open up the inside story on dazzling, dangerous dinosaurs. A charming read with more than 50 flaps to lift. A fascinating insight into the prehistoric world, aimed at budding paleontologists from four plus.